The IMM Global Executive MBA program is 19 months long and requires 48 credit hours. The program begins each March. 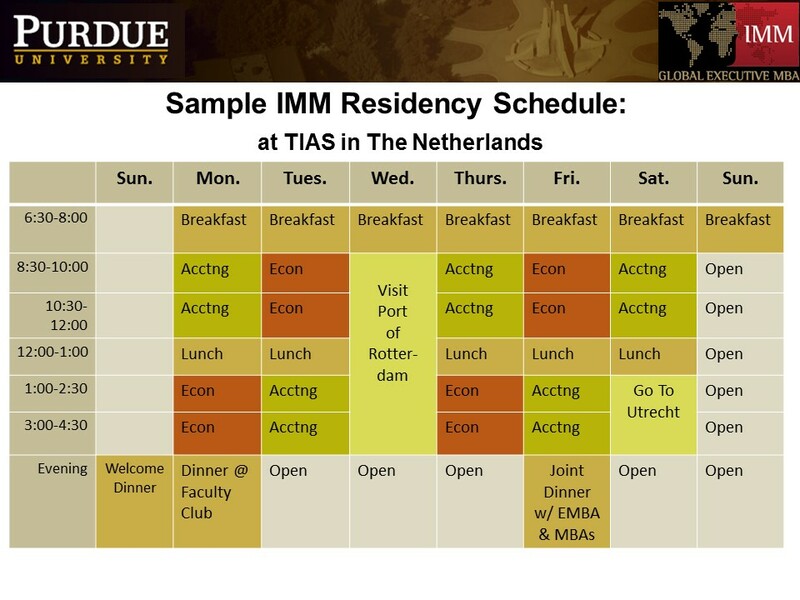 As an IMM student, you will study in seven countries on four continents. Six renowned universities partner to provide IMM students a truly global education. The IMM curriculum is organized into five modules that provide a unique blend of in-class and online learning. Modules consist of a preparation period, a 2 week on-campus residency, and an online exam period. Purdue EMBA Programs' Executive Director Aldas Kriauciunas explains our program structure in this video. Each residency is prefaced by an 8-10 week preparation period, during which students read assigned texts, complete and submit individual and team-based assignments, watch instructor-prepared videos, virtually gather with fellow students for weekly team meetings, and join online group discussions and virtual office hours as needed. The on-campus residencies include classes, company visits, guest speakers, career management offerings, and networking events. Each residency is followed by a nine-day online exam period. 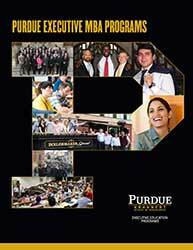 The IMM Global EMBA program launches with a 4-5 day orientation at Purdue. The IMM curriculum features core topics crucial for a business administration education; functional electives that vary depending on the interests and needs of the cohort; and participation in Active Learning Projects. These projects provide opportunities for our students to combine prior knowledge and experience with classroom learning and apply it in an active business setting. An ALP client is provided to the student teams and the project focuses on helping a firm diagnose and resolve a critical business problem. The teams are guided by a faculty member to provide the most beneficial hands-on experience possible. The Active Learning Projects provide opportunities for students to combine prior knowledge and experience with classroom learning and apply it in an active business setting. An ALP client is provided to the student teams and the project focuses on helping a firm diagnose and resolve a critical business problem. The teams are guided by a faculty member to provide the most beneficial hands-on experience possible. Click on the module links in the dropdown menu at top right for more details on courses and information about our faculty. Please note course offerings and faculty are subject to change. Our students visit companies while in-residency. These visits include a tour of the facilities and an interactive discussion with senior management. Companies are chosen to reflect core concepts within the curriculum and/or key industries of the country visited. This approach gives additional context to the learning in the program and insights into the challenges faced by managers around the world. Companies visited include Bao Steel, American Axle, Boeing, Kidzana, Amazon, Subaru, Cook Biotech, Codelco, Salesforce, Concha y Toro, Philips, and many more.